While many people in our society may have forgotten about the native crops of our region, the people of the Ajo Center for Sustainable Agriculture (Ajo CSA) surely have not. Ajo CSA noticed that many traditional crops and agricultural techniques that are unique to our region were in danger. How did they respond? They created the Adopt-A-Sonoran-Desert Crop Program: a seed-saving program that aims to preserve and promote native and regionally appropriate crops. Through this program, farmers and gardeners have the opportunity to preserve the rich culture of our native and regionally appropriate crops, and reap benefits that will not only save money, but positively impact the greater Arizona community. Not to mention, it gives families and children the opportunity to try something new! First off, the seed-saving program is completely free of charge. All it takes is an interest in preserving the history and culture of our region, and contacting the program coordinators. Soon after, you’ll be receiving seeds to grow and harvest. Once you become a grower of these regionally unique crops you’ll receive direct support from Ajo CSA staff who will provide you with advice and tips regarding your adopted crop and access to the results yielded from the newly expanded research branch. The only thing the program requires of you is to return a portion of daughter seeds or bulbs. These returned seeds restock the seed supply and keep the program sustainable! The inherent nature of these regionally appropriate crops makes them a powerhouse against the blazing Arizona heat and the drought prone desert landscape. Farmer Frank, a well-known farmer from Crooked Sky Farms is the originator of the current I'itoi onion line, just one of the crops available through the Adopt-A-Sonoran-Desert Crop Program. As a child, Farmer Frank quickly developed a fascination for seeds and soon after fell in love with farming. In 1993, the hopeful farmer was given 5 bulbs of I’itoi onions. The bulbs were meek and shriveled, but he decided to plant them anyways. With their inherent desert adaptations, the bulbs thrived. The 5 bulbs are the very same parent plants that reproduced, and are now part of the Adopt-A-Sonoran-Desert Crop Program. These are tough crops that are ready to tackle the challenges that come with Arizona landscape. 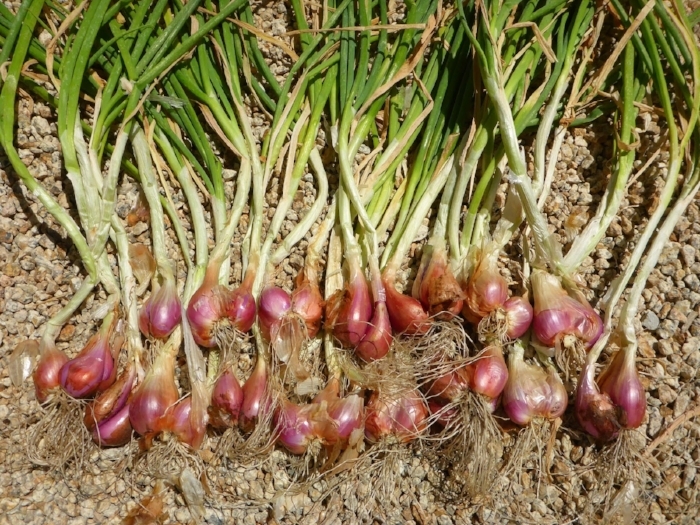 This bronze onion may remind you of a mix between a green onion and a shallot, and is an ideal crop to plant in the Arizona soil. Why? Not only is the onion delicious, which makes it an attractive crop for consumers, but Farmer Frank says the hardy onion seems "to require about a third less water than most, since they seldom get water more than twice a month here on the farm. Source: Photo Via Seed To Table. Reason #2 - You will save money. Regionally appropriate and native crops are well-prepared when it comes to appropriately responding to Arizona's growing challenges. Higher adaptation means lower risk, and results in closer to estimated crop yields. As these unique crops can survive through harsh conditions, fewer inputs are required for them to thrive. This translates to less water use, fewer soil amendments, and lower energy use –– translating to a lower financial investment per unit of output. The entire process creates a immense amount of savings! A desert adapted crop could be compared to the student that studied the most for a Math test. They will likely fare better than the students that did not. When a crop is innately prepared for harsh conditions you save money. Reason # 3 - You will foster Arizona pride. Farmer Apprentice Kyle Watkins and Farmer Sterling walked in to the culinary arts class at the local high school. Sterling carried what seemed to be a regular green watermelon - until he split it open. A collective gasp filled the room as the inside of the watermelon was unveiled. To the surprise of all the students, the watermelon was not a light pink or red color, but, instead was yellow! The students were in awe that what they thought was a "normal-looking" watermelon was actually an O'odham yellow-meated watermelon, a melon that is well-known for being very sweet. The best part of the entire experience is that it sparked curiosity within many students who began to ask more and more questions. Source: Image Via Seed To Table. There are currently 14 crop varieties in the Adopt-A-Sonoran-Desert Crop program. With these crops and many more, Ajo CSA is a regular at farmers markets and spends hours talking to interested customers who are blown away by the unique and flavorful varieties of these crops. There's no doubt that consumers always demonstrate intrigue at these “new” varieties. The key and goal of the Adopt-A-Sonoran-Desert Crop Program is to ensure that these crops stick around, and become part of the cultures of our desert dwellers. By adopting these crops you'll become an ambassador in fostering pride among all ages, and make the crops a unique point of pride in Arizona. Reason #4 - You will attract the environmentally conscious customers. Sure, the changing trends of consumers can be difficult to read, but the benefits of getting involved in this program early-on could help you set yourself apart from the variety of crops sold around the state. Customers make their decisions based on a variety of factors, focusing on more than just price. There is a shift that has resulted in customers caring about the impact the company is creating. These unique desert crops are part of a bigger program that is creating a sustainable way to continue to preserve the culture and history of Arizona while feeding our state with yummy food. Consumers that care about sustainability will be pleased to hear that these crops require less water and that you are using less energy to keep them healthy. Reason #5 - You will be part of a bigger movement. Over time, Ajo CSA envisions community members developing strong relationships with the plants and crops of the Sonoran Desert, and ultimately incorporate these unique crops in to their home gardens, add them to their weekly diets, save their own seeds, and build a tradition for future generations to take pride in their Sonoran Desert appropriate crop varieties. By getting involved in this program now, you become part of a legacy of farmers that care about preserving the unique culture and native crops of our state. The program plans to engage a large number of farmers and food producers across the state to begin quantifiable research on the benefits that growing Sonoran Desert Crops have in store for growers and gardeners. Ready to adopt a desert-adapted crop? Get started by attending next month's AZ Food & Farm Forum in Gilbert, a 2-day conference where producers, food entrepreneurs, and local food advocate discuss the way our state feeds itself. Ajo CSA will be presenting at the Forum, allowing you the opportunity to witness plantings, get familiar with the available crops, and even taste some samples! Can't attend the Food & Farm Forum but still want to participate? Please reach out directly to Nina Sajovec at Ajo CSA by email or phone (520-405-4872) to learn more.